After Effects CC | Level 2 Advanced class covers topics such as Motion tracking, complex tracking in Mocha AE, Particle simulation, advanced 3D, advanced Masking, Roto Brush Tool, Puppet Tools, Time-warp / Time-lapse simulations, exporting to Flash, and more. Learn how to arrange objects, light your scene, & create camera fly-throughs. 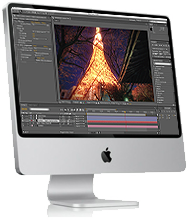 Our Adobe After Effects CC | Level 2 course is for Design and corporate communications professionals who need to advance their skills annd understanding of motion graphics and compositing.